Beachy Head & The Seven Sisters. Eastbourne to Cuckmere Haven - 6 miles. 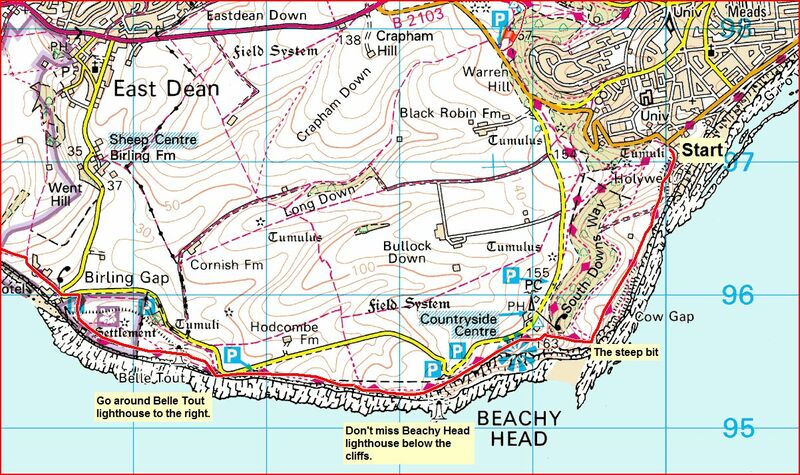 OS Explorer Map - Eastbourne and Beachy Head. For the South Downs Way - follow the acorn. Beachy Head is the first place that many of our incoming Sussex migrant birds touch down in the UK. Many of them may have come all the way from Africa, with the 20 odd miles of the English Channel being the last huge hurdle they need to overcome before they can get back to their breeding grounds in good old Blighty. They will have seen the white cliffs from miles away and the mere sight of them is enough to give them the last push they need to make it home. By the time they get back on British soil they're very tired and very hungry and so they take a well earned rest in the many gorse bushes and small shrubs and trees that are sprinkled over these rolling downs. Many rare continental birds as well as nearly all of our indigenous birds crop up here all of the time and you can never be sure of what you will see. But of course there are always predators to be seen, particularly Peregrines, waiting to ambush the bedraggled returnees. Beachy Head is also home to many rare and endangered plants, so please do not pick ANY flowers or plants or take their seeds. When exploring this beautiful area please keep in mind the birds who have fought every obstacle to be here with us. Keep to the paths and try not to disturb them too much and keep your dog under close control or if it doesn't come when called, on a lead. You will be bang up against the south coast of England on 500 foot high cliffs and make no mistake, when the weather gets up you can feel like you are in the middle of a tempest of biblical proportions. Check the weather forecast and take waterproofs and a warm hat with you anyway. On a hot day make sure you have plenty of water, sunscreen and a sun hat! This walk is not for the faint-hearted as there are some very steep climbs involved, as well as stiles and gates to get past. We've seen people with all sorts of disabilities on the walk but it is not suitable for wheelchairs. The cliff edges are not always obvious, especially in bad weather, they are also very crumbly with metres of them disappearing every year, so be careful where you are going at all times, keep back and enjoy the fantastic views from a safe distance. Go through Ashdown Forest to Wych Cross and onto the A22. Keep going for about 10 miles or so until you go past the Harley Davidson shop at Golden Cross. Go past the turning on the left for Gun Hill and take the next right turn into Camberlot Lane. Turn right at the end of that road at the school. Go straight on past Arlington Reservoir (or stop in and look for Ospreys) go straight over the next mini roundabout (NOT left for Eastbourne) straight on for Alfriston. Go slowly along here as the next left turn towards Litlington is easily missed. Cross the river and bear right and turn right at the next T junction (Litlington tea rooms up on left). Take this scenic road all the way to Exceat. Turn left at the T junction onto the A259 (a bus stop is on this corner) and when you come (slowly) down the steep hill into East Dean, take the right turn to the Seven Sisters Sheep Centre. Follow the most scenic road in Sussex through Birling Gap and over Beachy Head (not literally you fool!) and take the next right at the T junction down towards Eastbourne. 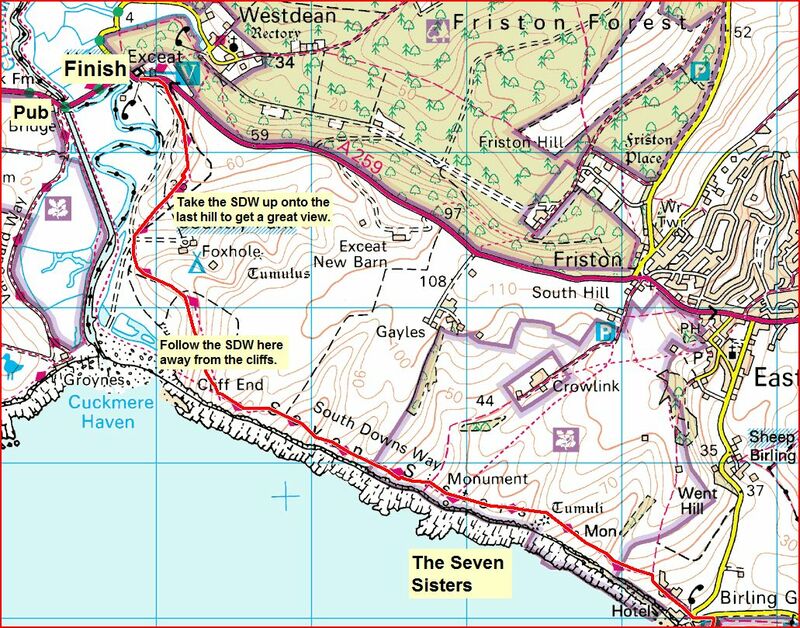 Remember to take the next right fork to end up at the western end of the seafront and the start of the South Downs Way (SDW). You can also get the train which costs about £15 from Crawley to Eastbourne. The walk directly from the station through the town to the start of the SDW is about a mile, but in the summer you can get a tourist bus from the station which will take you to the start. Alternatively you can get the number 13 bus, which will take you straight up to Beachy Head, although of course we highly recommend walking up. To get to the start from the station (1 mile, ~ 30 mins), first turn right out of the station and find the taxi rank. You want to take Grove Road which is on the opposite side of the road to the taxi rank. There's a sign post here that points you to the SDW. Grove Road soon bears left into Meads Road and goes past the police station and the stunning town hall. Keep going that way and go straight across Carlisle Road. Cyclists and horse riders must go right onto Carlisle Road, as that is where the start of the SDW is for them. Walkers can also go that way if they wish, but to get to the SDW for pedestrians, continue on Meads Road and bear left into Meads Street (DON'T go up Beachy Head Road). When you get to the main coast road (King Edward's Parade) turn right and you're there! At the start of the SDW, at the far western end of the seafront, there's an ice cream and tea shop. Ignore it (even though it usually smells of bacon sandwiches) and just get started. Instead of going straight up the hill on the well trodden South Downs Way in front of you, take the path immediately left to head for Cow Gap. This route follows the cliffs the whole way and meets up with the SDW again, so you can't get lost. There are some steps that go down to Cow Gap beach along the way if you want to go down there. Feel free to be totally gobsmacked by the flaunnae (made up word) living and growing on the downs, take in the views of Eastbourne and do the REALLY steep last bit up to Beachy Head (to teach yourself a ruddy good lesson, you lazy swine!). This will be the hardest bit of the whole walk, so congratulate yourself when you get to the top. Wash your sweaty little head at the toilets at Beachy Head car park and refill your water bottles if you need to. Do not drink beer: you've got lots of work to do yet. Keep walking along the cliffs: smiling, sweating etc and keep looking out for peregrines, but DON'T walk over the cliffs or get too near their crumbly edges. Make sure you try to get views of the lighthouse at the base of the cliffs though. You can see the spots along the edge where it is safe to stand and look at it as the many feet have left bald patches in the grass. At Birling Gap (3.5 miles, ~ 2 hrs from start of SDW) have some tea, eat, refill your water bottle (there is a drinking water tap outside the toilets) and empty your bladder. There are steps down to the beach where you can get great views of the cliffs. After Birling Gap there are 8 small hills to climb (The Seven Sisters) and they are brilliant! Don’t be scared: by the end you will be wanting more, trust me. The path continues up a gravelly drive behind the toilet block, follow it uphill to a little fenced-in group of trees but make sure you don't miss the left turn (signposted SDW) through the gate and carry on along the cliffs. Check your compass here, you want to be continuing west not north. Now you are on the famous Seven Sisters and they are spectacular. Yes, they are steep but they are reasonably small. Take your time and enjoy them. We find it is very hard to remember what number hill we are on. See how you get on. On sighting the spectacular Cuckmere River with its famous meanders make sure that when you reach the concrete path you take the SDW diagonally NE across the field up onto Exceat Hill. From up there you will get great views of the river. If you are really tired, then you can continue on the concrete path all the way to the visitors centre, but do you really want to walk on concrete? The walk takes at most 6 hours if you; stop at Cow Gap beach for a while; identify as many of the birds and plants as you can; stop regularly to admire the stunning views; kiss girlfriend/wife/other-half at all of the kissing gates; stop to eat, drink, rest etc and basically take a very relaxed amble. There is a bus stop just by the Golden Galleon (on the opposite side of the road to the pub) and there are plenty of buses (number 12) back to Eastbourne all day every day. There is another bus stop with a wooden shelter just before the visitors centre at Exceat (5 minutes walk from the pub). The bus back to Eastbourne is great and gives great views of the meanders in the river and downland views over the top of the downs. It costs £2.80 and takes 15 minutes. It stops just outside Eastbourne railway station and sometimes at the pier (check with the driver). If you need a local taxi, the number is 01323 720720 or their rank is at the train station. Don’t take too much food. Have a couple of sandwiches, some chocolate for 'emergency' energy and lots of fruit (fresh or dried or both. Dates are very good and so are nuts). You will find that you eat far less than you would imagine. 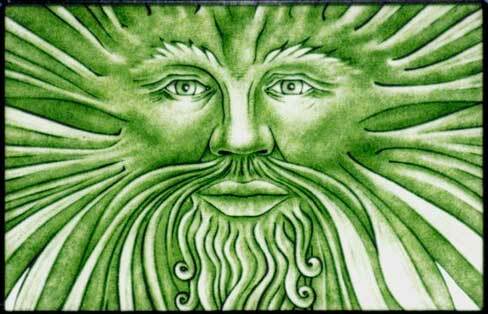 The important thing is water, so fill up whenever possible. Please take all your lunch rubbish home with you. There is food & drink to be had at Eastbourne, Beachy Head, Birling Gap and Exceat visitor centre (closes at 5.30pm) as well as the pub at the end of the walk. If you need any more information then just ask. The walk is always fantastic but if you go in the late spring or summer then all of the downland flowers will be in bloom and it's even better. Make sure you always stick rigidly to the countryside code, stick to the paths (to avoid disturbing breeding birds and animals), don't start any sort of fire, including disposable BBQs, and don't leave ANY litter. Parts of the downland along the walk are maintained by grazing animals, so always shut gates after you and keep your dog on the lead. There is a £1000 fine for not clearing up after your dog and make no mistake, farmers in Sussex will shoot dogs if they see them sheep worrying. If you want to go on a bit further before stopping for the night, then there is a Youth Hostel 3.3 miles further along the SDW at Frog Firle, which is to be found by crossing the river just before Litlington. Two other campsites to try are Pleasant Farm, Alfriston (01323 870560) and Buckle Caravan Site, Seaford (01323 897801). If you're looking for something really special and are prepared to pay for the privilege, then you can now stay at Belle Tout Lighthouse. Oh yes, take a hat!